For now, France is saying “No” to the all-encompassing TTIP trade deal with Europe, as it goes against its “essential principles,” President Hollande has said. The French trade minister has also criticized Washington’s reluctance to budge on many points. Speaking the day after negotiation papers were leaked by Greenpeace, France’s trade minister, Matthias Fekl, called Washington’s unwillingness to budge on many points “unacceptable,” saying it is jeopardizing the entire talks. "In view of the United States' state of mind today, that seems to be the most likely option," trade secretary Matthias Fekl said on Europe 1 radio, when answering if he thought the negotiations were in danger of stopping. "We want reciprocity. Europe offers a lot and gets very little in return. This is not acceptable," Fekl said. "It is an agreement which, as it would be today, would be a bad deal... "It can not be agreed without France and even less against France," he added. 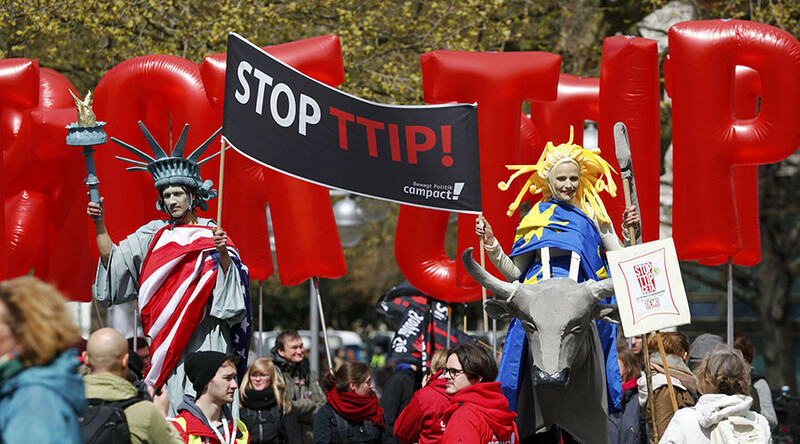 The Transatlantic Trade and Investment Partnership has been discussed behind closed doors since 2013. It will affect a trade zone inhabited by 850 million people, and has received staunch criticism from many Europeans, who believe it is not in their best interest. "Trade is not an end in itself, it is a tool," Fekl said, adding that "It would make no sense to have held the COP in December in Paris, this superb deal for the environment, and sign a few months after an agreement that would unravel it." According to Greenpeace, the deal threatens to do away with a whole series of protections, such as those relating to the environment, consumer protection and food produce. The documents reveal some wide rifts between the US and EU in those regards. The American authorities, however, don’t seem worried by such exposure. The US Trade Representative’s office has shrugged off the revelations, declining to comment on the “validity of alleged leaks,” a spokesperson said, adding, “the interpretations being given to these texts appear to be misleading at best and flat-out wrong at worst,” a spokesman said. Greenpeace wants the talks to stop. But the TTIP is Obama’s last chance as US president to get a deal in before his term ends in January. While the Transatlantic Trade and Investment Partnership (TTIP) between the US and Europe is set to create the world's largest free trade zone, many Europeans worry the agreement would elevate corporate interest above national interest. 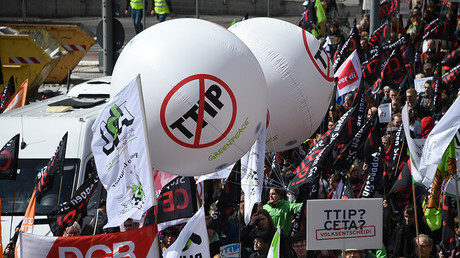 TTIP opponents say that cheaper goods and services would only hurt the EU and help US corporations. 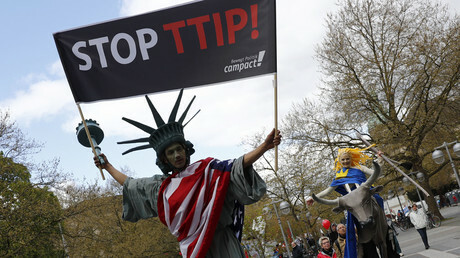 People have been going out to the streets to voice protest to the deal, the latest such one being in Germany’s Hannover.